If you love to entertain and want to whip up some fun, fruity cocktails that are so easy to make, you’ll have plenty of time to spend with your guests, this is your cocktail! This is what I’ll be serving up to visitors during the Labor Day weekend while we hang by the pool and soak up the last of the summer sun. 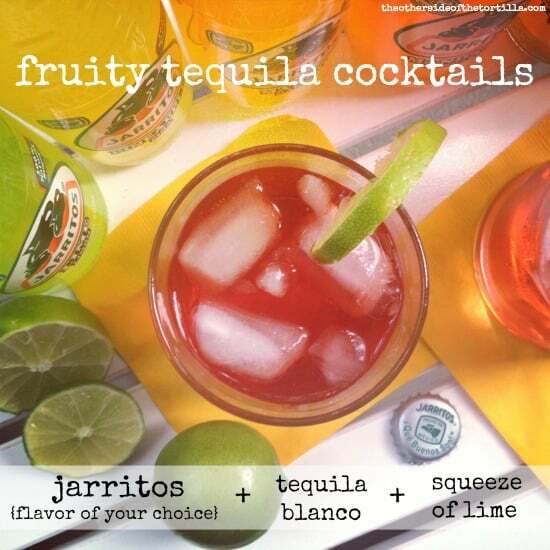 I typically stock the following flavors at home to make this easy cocktail: Fresa (strawberry), tamarindo (tamarind), mandarina (mandarin orange), piña (pineapple), guayaba (guava), limón (lime) and mango. For those who like to play bartender, you can try mixing some of the soda flavors to make more unique cocktails, such as pineapple-guava or strawberry-mango. If you like, you can also substitute rum for the tequila. Even when we’re not entertaining friends, I like to hang out on the balcony or by the pool sipping these fruity cocktails. I often get asked how to make pico de gallo by my non-Mexican friends and, sometimes, new readers here. If you’re a regular reader or you know me personally, you probably know where this is going. In our house, pico de gallo is not the typical fresh salsa you may be familiar with, made of tomato, onion and cilantro. 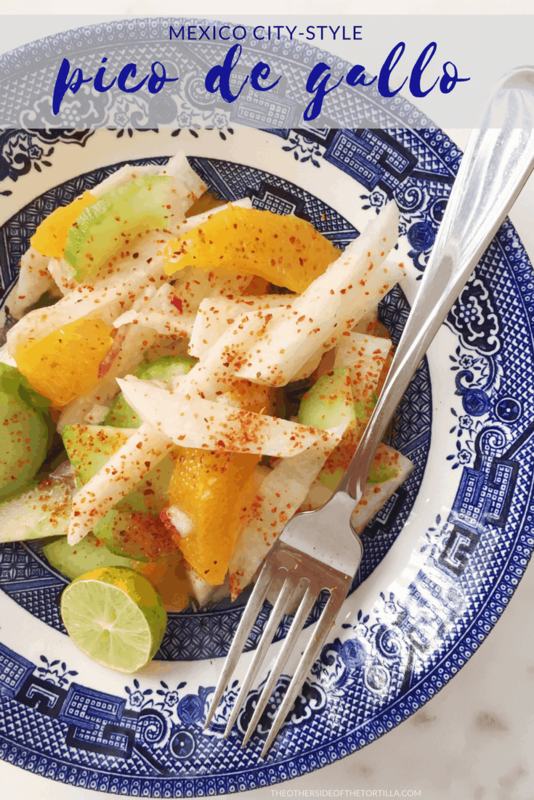 Instead, pico de gallo is a snack made with jicama, red onion, cucumber, orange, serrano chile, lime juice and sprinkled with Tajín. So, if you come to my house and ask for some pico de gallo, now you know what to expect. What a lot of people call pico de gallo, though, we call salsa mexicana. And it’s extremely easy to make! To be clear, in most places if you ask for pico de gallo, the recipe below is what you’ll get. Since I’ve been asked several times in the last week how to make this easy, fresh salsa, I decided I might as well share it here for anyone who doesn’t already know how to make it. It’s easy to assemble in a big batch because you can play with the amounts of each ingredient to taste, but it’s a little more difficult to get it right when making a very small batch for only one or two people for a single meal, so I’ve provided directions below for the portions that I use. A note, first: The chile is optional. I always put it in my salsa mexicana, but you don’t have to if you’re averse to spicy food. Or, if you want to go kind of half-way with it, you can cut a serrano chile open, remove the seeds and veins and chop it very finely. If you do that, you may still want to use half of the suggested portion and add more to taste as you can tolerate. But if you leave it out all together, just increase the amount of cilantro to taste. You’ll still have a nice salsa and no one will know anything is missing. In many places in Mexico, you can find street vendors with little carts, selling antojitos, or snacks. Usually, the standard offerings include chicharrones (pork rinds), chicharrones de harina (a fried, puffed wheat snack that looks orange) or papitas (potato chips). Served in a little plastic bag with a squeeze of lime juice and your choice of salsa, it’s a great snack whether you’re on the go or just want to take a leisurely stroll through the park. 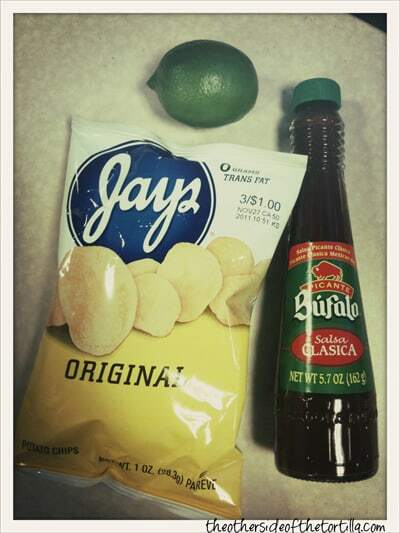 I like to keep a little bag of potato chips in my desk at work so I can make a quick afternoon snack—the only thing I need to remember to bring is a lime and a small bottle of salsa. It’s a very simple and typical Mexican snack. You can choose whatever kind of salsa you like; spicy, medium, mild or even a salsa like chamoy, which is a sweet and spicy mixture usually made with chile powder and a salted fruit brine. It’s up to you! I like to use the salsa pictured here, salsa clasica de Búfalo (but don’t be fooled; it’s not anything like buffalo sauce you’re used to seeing in the U.S.). It’s a slightly spicy and vinegary red salsa. All you have to do to make your own is open the bag (be careful not to tear it), squeeze half a lime (or more if you like) inside the bag and then pour as much salsa in the bag as you like. Close the bag up and shake it so the salsa and lime juice distribute somewhat evenly and then just open the bag up and enjoy. ¿Que rico, no? What’s your favorite kind of antojo de la calle? I’ve been experimenting in the test kitchen lately and coming up with some new recipes. Today I’m sharing my newest recipe for the #MizkanLatino cooking challenge, arrachera borracha con rajas de pimiento, or drunken skirt steak with grilled bell pepper strips. “Sabroso Grilling” was the theme for this challenge and the challenge ingredient was to use one of Mizkan’s World Harbors marinades, so I chose the Mexican-style fajita marinade…. 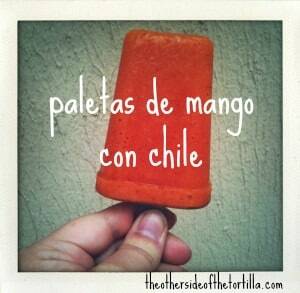 I wrote about my love for paletas and shared a recipe for paletas de mango con chile on the Kenmore Genius Blog recently. These are similar to mangonadas, but those usually include chamoy as an ingredient, and this recipe doesn’t. Hop over there to check out the post with some additional notes on the ingredients. Enjoy the yummy video! In a sauce pan, bring the water, sugar and lime zest to a boil, then reduce heat to a simmer. Stir until sugar is dissolved. Simmer for about 5 minutes to infuse the flavor of the lime zest and then remove from heat and let come to room temperature. Peel the mangoes and remove all the flesh. When you get close to the pit, you can just scrape it in a downward motion away from you to get the last bits off. Put the mango flesh (which should be about 2.5 cups) into the blender with the lime juice, sugar syrup and chile powder. Pulse on low for 10-15 seconds so that you get a puree that has some small mango chunks in it. Pour evenly into popsicle molds, making sure not to fill them all the way to the top; the popsicles will expand a little when they freeze, so leave a little room so they don't spill. 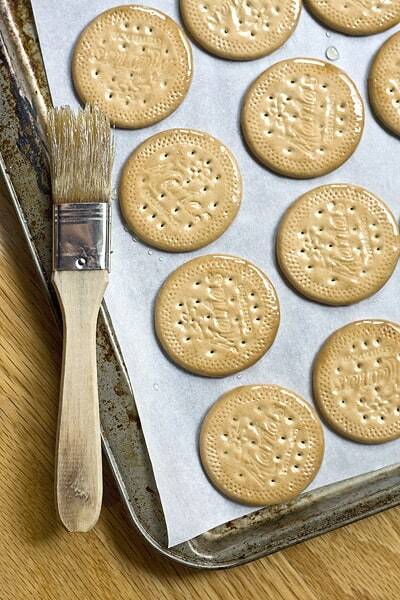 Place them on an even surface in the freezer for at least 12 hours (or longer if you use bigger molds). Once they’re frozen through, run the bottom of the mold under warm water just long enough to loosen them from the mold. Disclosure: I am compensated for my posts on the Genius Blog and provided with Kenmore small appliances to test but all my recipes and opinions, about the appliances and otherwise, are my own. At any parrillada, you can count on one side dish being the same, no matter what kind of meats are chosen for the main dish: cebollitas. I love grilling. The smell of the charcoal, the crackling sound of the fire roasting the food and the anticipation of what’s about to land on my plate. And whenever we grill in Mexico, my suegro (father-in-law) is the king of the barbecue. This dish is so simple and easy (and almost totally impossible to mess up even if you’re not a grilling pro), it’s the single dish that most reminds me of a Sunday parrillada in Mexico. You can add as much or as little lime juice and salsa Maggi, a Worcestershire-style seasoning sauce, or soy sauce as you like – it all depends on your taste buds. The Maggi sold in the U.S. doesn’t taste the same as salsa Maggi sold in Mexico, so I sometimes substitute soy sauce. Not only is this dish often served at barbecues and family gatherings, you can also often find them at little street food stands around Mexico. I especially love to pair this side dish with tacos de rib eye and my Mexican chimichurri-marinated flank steak…. 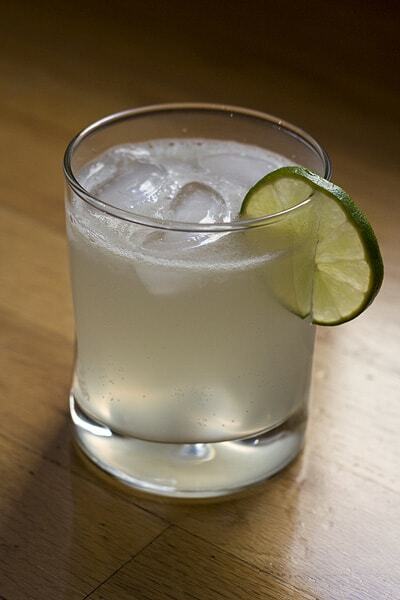 I love fizzy drinks and my all-time favorite fizzy drink is a Mexican limonada, of course! Every time we go to Mexico, and particularly when we’re visiting the beach, a limonada is always the drink I choose to quench my thirst after getting my fair share of sunshine. I’ve also been known to order it everywhere from poolside to fancy restaurants – I just can’t get enough. This drink is so simple to make, yet I get so many emails and phone calls from friends asking how to make it. And with the Wordless Wednesday post last week about limonada y sol, I figured it would be almost cruel to not tell you how to make it. I’m finally sharing a recipe so you can have this sweet fizzy drink at home! You can also make this drink with still water, but the carbonated water gives it a little something extra to make it different. I typically use lightly carbonated water, but you can use whatever you like depending on your preference for bubbles. I like to drink limonada when it’s hot and sunny, but also when I’m really missing México lindo y querido…. However, in parts areas of Mexico if you ask for pico de gallo you’ll end up with a sort of fruit salad-looking thing that you perhaps didn’t intend to order. 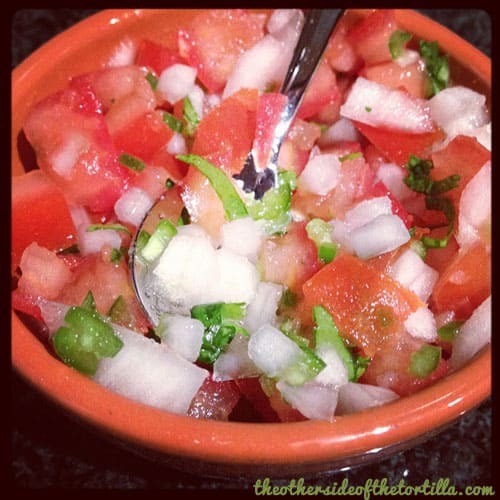 But make no mistake, this kind of pico de gallo is one you’ll definitely want to try! It’s a favorite snack in our house–great for a lazy afternoon watching fútbol or even for entertaining guests…. The weather is getting warmer and that can only mean one thing: an explosion of Mexican street food carts popping up on every corner in the neighborhood where I do all my grocery shopping. Among the carts that make my mouth water the most is one from which the sweet smell of roasted corn wafts through the spring air – and through my car window enticing me to stop for a quick treat. Yep, you guessed it: esquites. 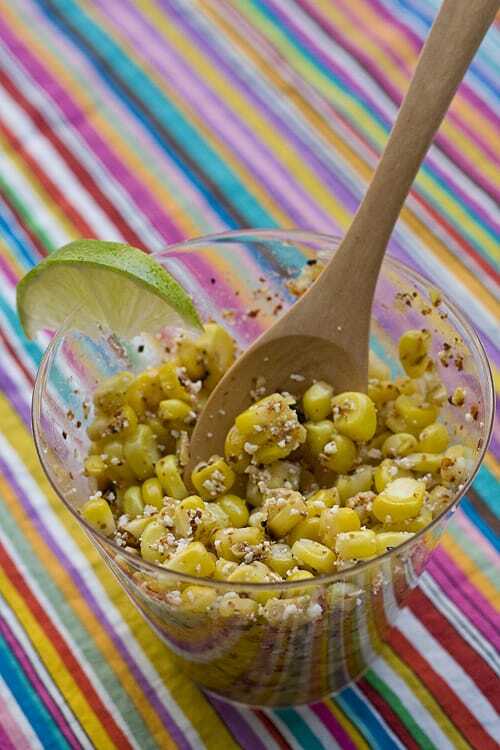 The key ingredients of this antojito are roasted corn, lime juice, salt and dried ground chile piquin. And then there are the customizations and variations on the snack that can make it so unique from place to place. 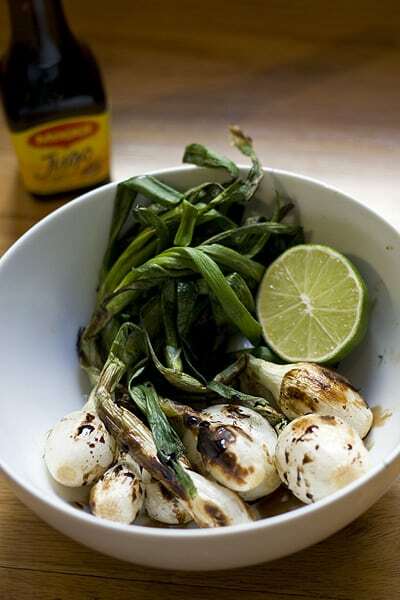 Sometimes sauteed with butter or onions and epazote, it can also be topped with mayonesa or crema Mexicana. And my favorite touch: a sprinkle of queso cotija, a dry, crumbly cheese with a little bite. It’s usually served in a Styrofoam or plastic cup on the street, but don’t let the simple presentation fool you. 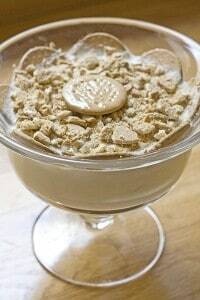 Serve this at a spring or summer backyard barbecue and impress your guests with this simple treat they’re sure to love. 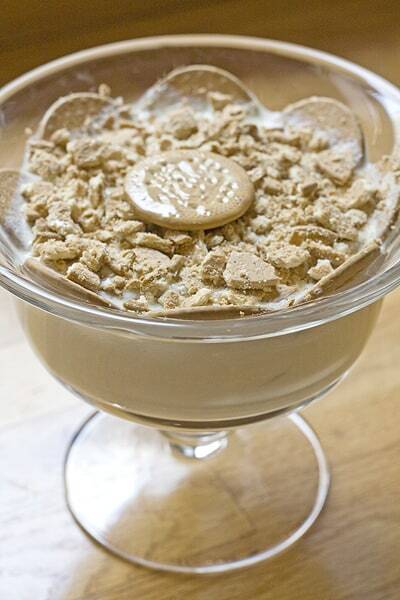 Or just make it at home as a weekend snack! Part of the beauty of this dish is that you can make changes or adjustments to your own tastes very easily without compromising any kind of measurements or balance so long as you follow the base of the recipe by roasting the corn either with butter or by adding a little water to the corn once you’ve cut it to help create a little juice. The portions of the lime juice, chile and toppings is up to you. The end result should be a sweet, sour, salty and spicy taste in every bite…. 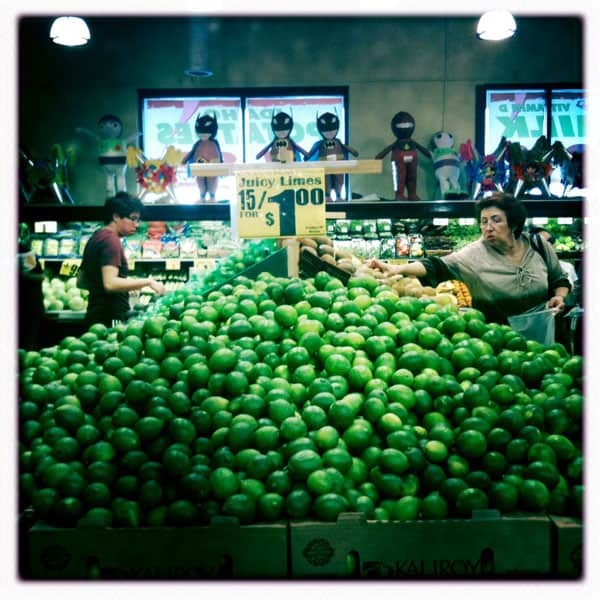 Every year, right before Easter, limes from Mexico are so cheap that they’re practically giving them away at my favorite grocery store in Pilsen. And I know exactly what to make with them! It’s been awhile, but I think a postre de limón is in order! 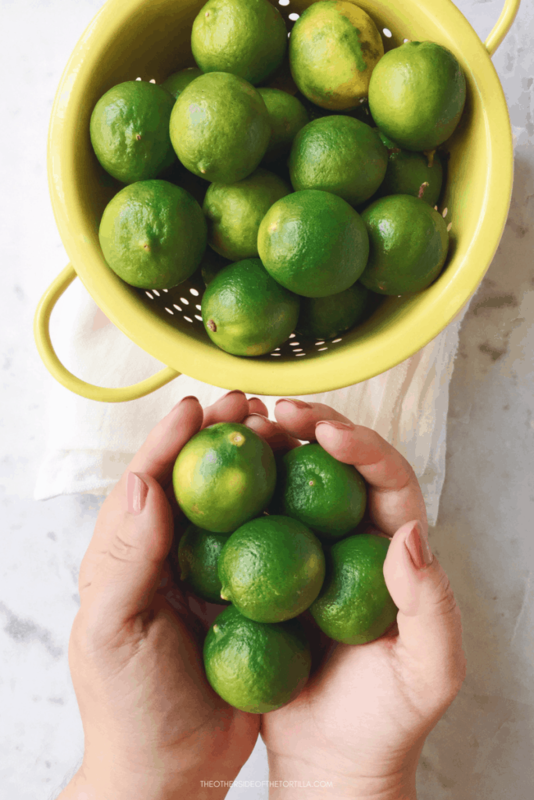 What do you like to make when limes are on sale? I still remember the first time I saw tunas growing wild – José and I were visiting Mexico City one warm week at the end of the summer several years ago. One afternoon we were bored, so my suegra suggested that José take me on an official tour of Ciudad Universitaria. Also referred to as CU, it is home to the main campus of Universidad Nacional Autónoma de México (la UNAM or in English, the National Autonomous University of Mexico), the largest university in Latin America and a UNESCO World Heritage site since 2007. This year on September 22, UNAM celebrated 100 years since its founding as the National University of Mexico as it was conceptualized by Secretary and Minister of Public Instruction and Fine Arts, Justo Sierra, and inaugurated in 1910 by President Porfirio Díaz. The university is also the successor to the Royal and Pontifical University of Mexico, founded by Spanish Royal Decree in 1551 – technically making UNAM one of the oldest universities in the Americas. On the campus grounds, besides the historic buildings designed by some of Mexico’s most well-known architects, murals and sculptures by famous Mexican artists, an Olympic stadium that has hosted a Summer Olympic Games (1968) and a World Cup (1986), and an impressive number of students, faculty and staff, there exists a serene, green space that is as close to the original land’s flora and fauna as it might have grown freely during the height of the Aztec empire…. ¡Feliz Día de la Independencia, México! 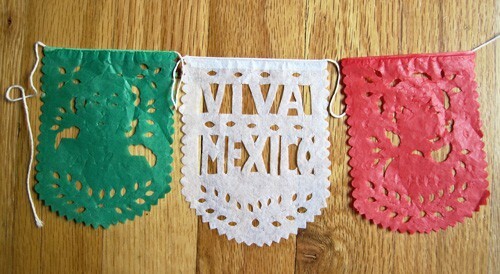 Did you watch the Grito last night? In my house, we hung papel picado and waved our Mexican flag as we watched the celebration starting in Mexico City’s zócalo. My heart was filled with emotion seeing the zócalo, where I have stood in awe many times, brimming with people from all corners of Mexico to celebrate the bicentennial of Independence from Spain and 100 years since the Revolution. If you want to watch last year’s Grito and attempt a very traditional Independence Day recipe, you can check out the chiles en nogada I made and posted last year here on The Other Side of The Tortilla….